We’d love your help. Let us know what’s wrong with this preview of The Stuff of Stars by Marion Dane Bauer. Before the universe was formed, before time and space existed, there was . . . nothing. But then . . . BANG! Stars caught fire and burned so long that they exploded, flinging stardust everywhere. And the ash of those In an astonishing unfurling of our universe, Newbery Honor winner Marion Dane Bauer and Caldecott Honor winner Ekua Holmes celebrate the birth of every child. To ask other readers questions about The Stuff of Stars, please sign up. It is a poem! In a picturebook! With marbled illustrations! ABOUT THE BIG BANG!!!! “The nitrogen in our DNA, the calcium in our teeth, the iron in our blood, the carbon in our apple pies were made This was a disappointment.
. . . yet he is never mentioned, or even quoted. I would have rated this less, but, oh, those illustrations! I have a shelf on Goodreads called "abstract idea," which is for picture books that I admire for how they visually represent something abstract. Here, illustrator Ekua Holmes may get the top prize, as she faces the challenge of illustrating the birth of the universe, the earth, and a child, described in lovely, spare verse by Marion Dane Bauer. Her images (hand-marbled paper and collage assembled digitally) dazzle the eyes with swirls of color and pattern. I expect Caldecott buzz for this one, t I have a shelf on Goodreads called "abstract idea," which is for picture books that I admire for how they visually represent something abstract. Here, illustrator Ekua Holmes may get the top prize, as she faces the challenge of illustrating the birth of the universe, the earth, and a child, described in lovely, spare verse by Marion Dane Bauer. Her images (hand-marbled paper and collage assembled digitally) dazzle the eyes with swirls of color and pattern. I expect Caldecott buzz for this one, too. I'm really sad that the authors of what could have been a gorgeous non denominational book about the wonder of life and the interconnectedness of the universe decided it had to include 'weighty as God' putting itself squarely into capital G and singular territory and ruling out any non-theist or non-monotheistic individuals. It's still beautiful, it just has a degree of exclusiveness it really didn't need. Marion Dane Bauer's poem about creation (the big BANG!) is illustrated with hand-marbled images by Ekua Holmes. Very visually arresting and thoughtful for children. Of course, who doesn't love being told they are made of stardust? The creation of the universe, the solar system, and Earth are stunningly and spectacularly imagined in verse and art. Lovely book with evocative abstract illustrations depicting life from the Big Bang to the birth of the reader. This book is absolutely stunning. Each page is an explosion of color and wonderful to look at. This is a picture book for children of all ages–very young children will love all the colors in the pictures. Young children will enjoy the story of the universe and the message that we are all made of the same stuff as stars. The Stuff of Stars is a beautiful book that’s a great introduction to how the universe was made and how the earth, animals, and humans came into being. Really, it shows children that they are connected to life and the universe, so it’s a great start on teaching them about all the different types of species that live or have lived on our planet. This would fit nicely into a teacher’s unit on science as an introduction, or even in an art unit to show how abstract art can still tell a story. The words themselves are lyrical without being overly poetic or having a particular rhyme scheme, but there’s a definite rhythm to the story itself. Highly recommend! I’m looking forward to gifting a few young relatives with this book this Christmas, myself. Stunning collage-style illustrations accompany a beautifully worded poem about how the earth and life exploded into being. This captivating picture book is one of my 2019 Caldecott favorites. 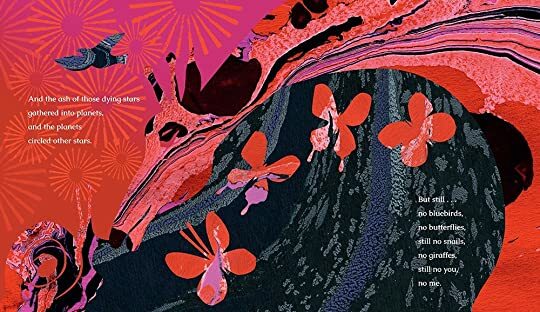 This poetic and visually explosive picture book describes the big bang in lyrical text that captures the beauty and drama of the beginning of the universe. My almost-five-year-old was fascinated by the illustrations and though the book does not mention religion at all, she immediately attributed the images she saw to God, which made me feel good about her understanding of the relationship between faith and science. This book makes the abstract concept of how the universe came into being into som This poetic and visually explosive picture book describes the big bang in lyrical text that captures the beauty and drama of the beginning of the universe. My almost-five-year-old was fascinated by the illustrations and though the book does not mention religion at all, she immediately attributed the images she saw to God, which made me feel good about her understanding of the relationship between faith and science. This book makes the abstract concept of how the universe came into being into something relatable, dynamic, and awe-inspiring. Ekua Holmes' illustrations are absolutely awe inspiring! This picture book touched me so much. Gorgeous illustrations and adept use of the page turn for dramatic effect. I had chills, my eyes teared up. I want to buy it for all of my niecephews. The illustrations take this book to a new level. This absolutely gorgeous picture book follows the journey of a tiny speck through the big bang. The speck becomes stardust, and the stardust becomes planets, plants, animals, and eventually, YOU (or the baby/child you are reading this to). Bauer's text has a rhythmic cadence to it that lends itself to reading out loud, and Holmes' illustrations give a dreamlike atmosphere to the book. The marbled pictures are wonderful, although maybe a bit too abstract for younger children - but still provide g This absolutely gorgeous picture book follows the journey of a tiny speck through the big bang. The speck becomes stardust, and the stardust becomes planets, plants, animals, and eventually, YOU (or the baby/child you are reading this to). Bauer's text has a rhythmic cadence to it that lends itself to reading out loud, and Holmes' illustrations give a dreamlike atmosphere to the book. The marbled pictures are wonderful, although maybe a bit too abstract for younger children - but still provide good opportunities to talk about colors, shapes, and imagery. 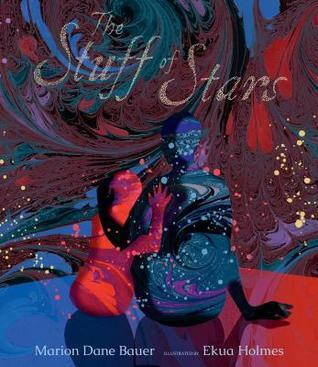 At first I thought this book was going to be similar to On The Night You Were Born by Nancy Tillman, but while Tillman's book suggests that a child is the center of the universe, The Stuff of Stars instead teaches a child that they are one of many miraculous pieces of our infinite universe. I have very mixed feelings about this book. Clearly it is a work of art, from the outrageously talented illustrator who has already won a ton of awards to the gorgeous, poetic word choices. I think it's bound to attract some controversy in school libraries where patrons are dissatisfied with books that teach explicitly about the big bang and evolution, but that's why this book is so great! It's so artsy and de-politicized, despite being a controversial topic. Ultimately, I worry that books like I have very mixed feelings about this book. Clearly it is a work of art, from the outrageously talented illustrator who has already won a ton of awards to the gorgeous, poetic word choices. I think it's bound to attract some controversy in school libraries where patrons are dissatisfied with books that teach explicitly about the big bang and evolution, but that's why this book is so great! It's so artsy and de-politicized, despite being a controversial topic. GORGEOUS. This is an amazingly illustrated picture book that, through poetry, tells the story of the creation of the universe and turns it into a beautifully welcoming tribute to a new child. Stunning. I loved everything about this picture book. The rhythm pairs perfectly with the illustrations. Marvelous. This review has been hidden because it contains spoilers. To view it, click here. This had the most beautiful colors and it drew me in. Though it is for children, I was invested in how magnificent the colors were and enjoyed reading it. As much for the parents of those children, this is beautiful, and loverly. Poetic and gorgeous - perfect for Valentines Day! Stunning artwork, but not really a kids' book. Also the idea of the Big Bang hurts my head. A simple stardust, big bang theory story with gorgeous artwork to accompany the story. Lovely verse on how of all the people in the world, the teller is so glad to have the listener in their life. Marion Dane Bauer is the author of more than eighty books for young people, ranging from novelty and picture books through early readers, both fiction and nonfiction, books on writing, and middle-grade and young-adult novels. She has won numerous awards, including several Minnesota Book Awards, a Jane Addams Peace Association Award for RAIN OF FIRE, an American Library Association Newbery Honor Aw Marion Dane Bauer is the author of more than eighty books for young people, ranging from novelty and picture books through early readers, both fiction and nonfiction, books on writing, and middle-grade and young-adult novels. She has won numerous awards, including several Minnesota Book Awards, a Jane Addams Peace Association Award for RAIN OF FIRE, an American Library Association Newbery Honor Award for ON MY HONOR, a number of state children's choice awards and the Kerlan Award from the University of Minnesota for the body of her work.